The Secret of the Forgotten City is one of the more entertaining of the Nancy Drew books form the late 1970's. Nancy and the gang (Bess, George, Ned, Dave and Burt) join with other Emerson College Students on an archaeological dig outside of Las Vegas, searching for lost gold. However, the mystery begins back in River Heights, when an Indian woman visits Nancy in hopes that Nancy can help her translate the petroglyphs on some stone tablets. All of the tablets, except one are stolen and Nancy is quickly involved in this mystery. It is pretty amazing that Nancy is so well known that a woman would travel from Nevada to have her try to decode petroglyphs. But Nancy does some amazing things in this book. She knows an obscure Mexican dialect of Spanish. She plays guitar. She runs out of gas in the desert. Well, I guess that last one was pretty stupid, but most of the time Nancy is on the ball. She devises a signaling system, in code, for her friends to use to thwart any suspects who might be tailing them. The only thing is, they always look around and confront the bad guy who has been spying on them! The code is more silly than smart. Also She and Ned get lost in the Valley of Fire in 102-degree heat, not too bright. But Nancy does make some clever deductions about the petroglyph symbols and they do actually work on the archaeological dig. They meet up with students from the University of Nevada (UNLV has a huge presence in Las Vegas). Next stop is the Valley of Fire. The Valley of Fire is a real place. It is Nevada's oldest state park. Because of the large number of petroglyphs in the area, it is believed that the ancient peoples of the desert performed ceremonies among these rocks, as well as hunting and camping there. Mouse's Tank is a famous area of the Valley of Fire because an outlaw, in the 1890's used it as a hideout. The tank itself is a natural basin between two boulders. Small pools of water collect here during rainstorms. The water stays here most of the year, which may explain why there are so many carvings by the ancients in this area. Any source of water in the desert is important. IN the Nancy Drew book, the bad guy also uses Mouse's Tank as a hiding place. Nancy and the girls also visit the Lost City Museum. This museum was created to exhibit artifacts that were excavated when the Hoover Dam was built. The waters of Lake Mead covered several Anasazi Indian sites when it was filled to capacity. The Civilian Conservation Corps assisted in the excavation of these Indian sites and in the construction of the museum. The museum is currently owned by the State of Nevada and is involved in ongoing archaeological research in Anasazi Indian sites in the state. While traveling around the southwest earlier this year, I had the opportunity to camp at Valley of Fire State Park. It was an amazing experience. To be able to walk around those ancient rocks and view petroglyphs made by Indians thousands of years ago is really fascinating. The rock formations really do look like a variety of animals. Just like Nancy and her friends discovered! My favorite part of the trip was waking up with the rocks all lit up by the rising sun. You can see why they call it the Valley of Fire. 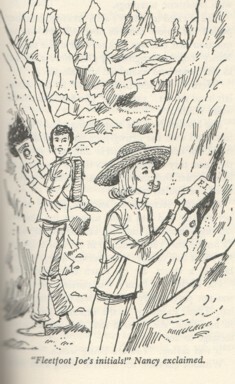 OF course, Nancy finds all the stone tablets, deciphers the petroglyphs, uncovers an underground river, and discovers gold! I saw a gorgeous sunrise, bighorn sheep, a jackrabbit and a coyote. And I didn't get lost once!